Recently we made available a manuscript of an unpublished work on sundials by Bernardino Baldi that had been missing since 1783. 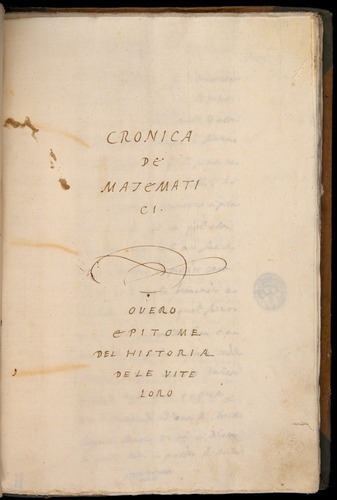 The OU History of Science Collections hold a second Baldi manuscript: his autograph copy of Cronica, a 16th-century history of mathematics, now digitized in its entirety and available from the Collections’ Online Galleries. The Cronica arranges its brief biographical entries as a genealogical account of the restoration of mathematics from Ancient Greece (first entry: Euphorbus) to contemporary Italy (final entry: Guidobaldo del Monte), including an impressive list of Arabic practitioners. As such it was one of the first histories of mathematics written by a European (though not the first published), and perhaps the first to be written by a European mathematician. It was an attempt to do for mathematics what Vasari had done for art. The manuscript, we learn from internal evidence, was probably completed in 1596: the final four mathematicians mentioned (Clavius , Aluigi, Magini , Guidobaldo del Monte ) all have 1596 as their date. The entry for Guidobaldo mentions some books already printed, others not yet written – this confirms a date of composition between 1580 and 1600. BALDI, Bernardino. Cronica de Matematici. Overo Epitome del Historia de le Vite Loro. Manuscript, brown ink, 22 lines per page. Folio [28 x 19 cm], (2) ff., 183 pp., (4) ff. Bound in 18th century half calf (stained green) and lacquered paper over boards, spine with raised bands and calf title label with tools of the Albani Library , covers slightly abraded. Albani shelfmark 631 on front endleaf. Unidentified private library stamp on leaf following title, a rather blurry cardinals hat with RA at bottom of escutcheon; some worming in blank gutter margin of title and the first few leaves (no loss); some minor toning, but generally a fresh copy, excellent. The manuscript appears to be the sole witness for the text in Baldi’s own hand, and most likely served as the basis for the printed edition, which like many of Baldi’s works, was only published posthumously (1707). A polymath of remarkable range who left a large corpus of writings, Baldi (1553-1617) was a serious mathematician and translator of mathematical works; he studied in Urbino with Federico Commandino and Guidobaldo del Monte (see previous post). The printer’s motive for publishing the Cronica in 1707 was to prepare an audience for the more detailed – if less inclusive – two volume Vite [Lives] which never followed. Rediscovered only in 1972, the voluminous Lives has meant that the less detailed Cronica has received little attention. But as the printer Monticelli points out, rather than being merely an abridgment of the larger project, the Cronica, with 366 biographical entries, is over half again as large as the Vite and represents a different but related project for the construction of a history of mathematics. That the Cronica was Baldi’s own work, rather than an abridgment by later readers or printers is attested by Marcantonio Vergilii Battiferri who mentioned in his funeral oration for Baldi (1617) a manuscript he called ‘Cronology of dates and brief Eulogies [of all the mathematicians up to our own day].’ Again in 1621, we find the Cronica distinguished from the project of the Vite: in the first manuscript catalogue of Baldi’s own writings, drawn up by Fabrizio Scarloncino and published in his edition of Baldi’s In Mechanica Aristotelis Problemata Exercitationes, the one-volume Epitome is listed separately from the two-volume Lives. It seems that when the work was printed in 1707, it was from the present autograph copy, or one derived from it: there are occasional additions to the main body of the text (in one case consisting of an entire biographical entry) that correspond precisely to the printed version. There is one correction in a hand that is not Baldi’s, of Commandino’s mother’s surname; this correction is also found in the printed text. 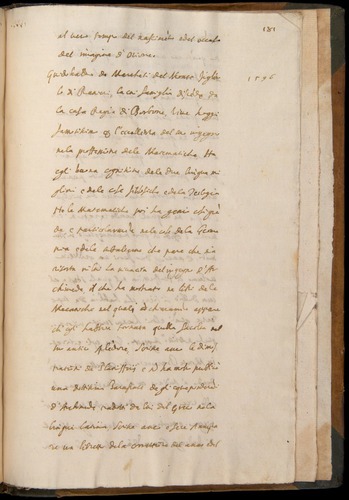 Most of Baldi’s manuscripts were acquired shortly after his death by the Albani Library , founded by Orazio Albani and consolidated by his grandson Gianfrancesco, who became Pope Clement XI in 1700. It is possible that the present manuscript left the Albani collection at the time of its printing and never returned, for while it bears the binding shelfmark (no. 631) of the Albani library, and is cited in Crescimbeni’s early eighteenth century Life of Baldi as being in Clement’s XI’s library, it did not pass with the other Albani Baldi manuscripts into the Boncompagni collection when that collector purchased them in 1857/8. The two Boncompagni manuscript catalogs mention a manuscript of the Cronica, and that of 1892 even refers to the Albani shelfmark, but both entries make it clear that they are referring to a copy of this manuscript, probably made in the mid-seventeenth century by Orazio Albani. Boncompagni’s Baldi collection, including this copy and both the originals as well as copies of the Vite, were bought by Luigi Celli in 1898 and bequeathed by him in 1939 to the Istituto della Carita Antonio Rosmini in Rome, where they were rediscovered independently in 1972 by Bronislaw Biliński and Paul Rose. 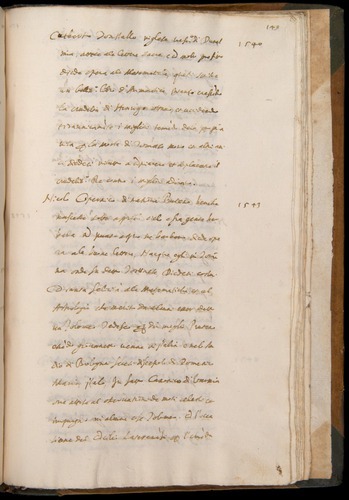 Biliński makes it clear that the manuscript of the Cronica now in Rome (ms 68), which corresponds precisely to ms 68 of the 1892 Boncompagni catalogue, is a seventeenth-century copy (Rose is incorrect in claiming that it is the original). A comparison of these manuscripts would clarify the work’s printing history. The work was later reprinted along with other printed works as Versi e Prose Scelte di Bernardino Baldi (Firenze, Le Monnier, 1859). Just what happened to the autograph manuscript between its printing and the present day is unknown. As yet unidentified shelfmarks show that it might well have travelled for part of its life alongside the newly discovered Novae Gnomices Libri Quinque, and De Firmamento et aquis opusculum, which were also in the Albani library but did not enter the Boncompagni collection. Further research is required to establish its later provenance. and 4th of August 1944 when the building was set fire by the Germans. Other manuscripts were sold privately from the heirs of the Albani family – it is impossible to know exactly what and when. In 1928 there was the last big sale: 10,000 printed books and several manuscripts of the Albani Collection went to the Catholic University of America (Washington D.C.), where they still are. Paul L. Rose, The Italian Renaissance of Mathematics: Studies of Humanists and Mathematicians from Petrarch to Galileo (Geneva, Droz, 1975), esp. 243-79.